It is one of the major factors older people worry about. social loneliness, stemming from the absence of a broader group of contacts or an engaging social network (e.g., friends, colleagues, and people in the neighborhood). As such, loneliness can be felt even when surrounded by others. People who took part in more health-maintaining and independence-maintaining behaviours were less likely to feel isolated and more likely to feel that their community was a good one to grow old in. Nearly 200,000 older people in the UK do not receive the help they need to get out of their house or flat – 30% would like to leave more. 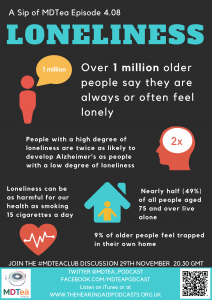 Loneliness has an impact on wellbeing and a range of personal circumstances such as poor health, living alone and lack of support network are contributing factors to loneliness. (Office for National Statistics (ONS) 2015, Age UK 2015). Quick review here of the geriatric giants: Incontinence, Immobility, Instability, Impairment of intellect. Lonely people use sedatives, sleeping pills and alcohol more than others. Furthermore, loneliness is associated with poor sight,hearing impairment, and sleeping problems, as well as with dietary inadequacies. How to Engage people in the assessment of loneliness? We think the key thing is to be inquisitive and ask the question…but who to ask? When? 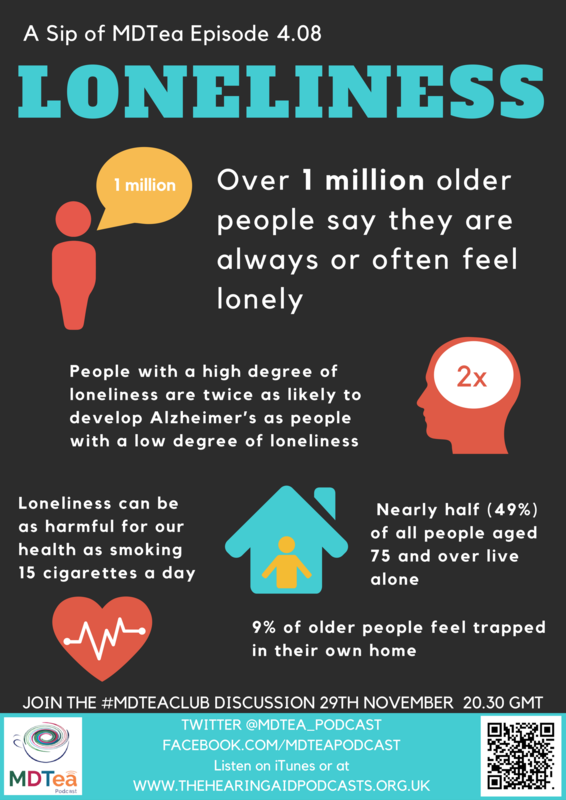 What are the factors associated with loneliness? What does their social world look like to them, and how is it experienced? Does the person have supportive relationships with family and friends? Are there local formal or informal social groups to which the person belongs or could belong? Are there factors that prevent social connection, such as a lack of transport? Has the person experienced a recent significant change in their life (this might include bereavement, moving house, retiring, physical ill health, stopping driving)? When to think about loneliness? Estimates of prevalence of loneliness tend to concentrate on the older population and they vary widely, with reputable research coming up with figures varying between 6 and 13% (up to 8.5 million people (given UK population of 65.5million) of the UK population being described as often or always lonely. There may be other important factors at play,, but there is evidence, particularly from ELSA, that being alone (especially without a partner or spouse) is the major determinant of loneliness in the majority of older people in England. 11–17 per cent were socially isolated in 2001 – these rates had remained relatively stable in the previous 50 years. The Growing Older (GO) project had isolation and loneliness as one of its 25 themes. Loneliness has complex causes – schemes designed to address it need to take other circumstances into account. Targeting those – lower socio-economic groups, widowed, physically isolated, people who have given up driving, those with sensory impairment and the very old has proven most effective. Physical activity interventions were also effective. Ineffective interventions shared one characteristic, they were one-to-one activities conducted in people’s own homes. A more recent review found similar things but was able to pull out key elements of potentially successful interventions. Offering social activity and/or support within a group format. Interventions in which older people are active participants also appeared more likely to be effective. A further review of 5 different services looked at what within the services was effective (what’s the recipe if you like). Findings suggest that befriending offers some compensation for loss of elective relationships from older adults’ social networks, providing opportunities for emotional support and reciprocal social exchange through development of safe, confiding relationships. Good conversational skills and empathy were the foundation of successful relationships within which commonalities were then sought. Befrienders broadened befriendees’ perspectives on life (particularly among older adults in residential care). Social engagement was a powerful mechanism of action, particularly in terms of connecting people back into the community, reinforcing meaningful social roles and connecting to a past life that had often been significantly disrupted by loss. One such programme is the ‘Call in Time’ programme run by Age UK. It’s easy for people to sign up (or you to sign people up) and all the information is on the Age UK website. Loneliness is reported by around 5-7 per cent of older men. Research has shown that social isolation, loneliness, and stressful social ties are common in men and associated with poor physical and mental health, higher risk of disability, poor recovery from illness and early death. But finding social activities that are acceptable by older men is a challenge. Older men are less likely to join groups than older women (and that is where much of the intervention evidence is as we have seen).. Participation in work-like activities may give men a sense of achievement and belonging. Studies demonstrate that successful interventions for which facilitate learning new skills, using/improving acquired skills, sharing knowledge with peers, promote a sense of accomplishment, and provide opportunities social engagement in a fun and engaging manner. The core elements of Men’s Sheds are that they are voluntary and social organisations providing hands-on activities for men aged 50 years of age and older who are co-participants in a defined space. Sheds provide a space for older men to meet, socialise, learn new skills and take part in activities with other men. Most Sheds are equipped with a range of workshop tools. Shed programmes aim to improve men’s physical, emotional, social and spiritual health and well-being. The role of a Shed in encouraging and engaging men in informal adult learning activity is thought to be particularly important. Some Sheds also provide health related information and ‘signpost’ men to relevant services. In almost all cases, they are tailored to their local context, rather than being standardised. Two broad categories of Shed experience emerged throughout the findings. Firstly, for some, Sheds present a pleasant and desirable hobby or activity; secondly, for others, particularly older men at risk of social isolation or emotional breakdown, they offer a vital support mechanism. The overall Shed project appears to achieve its aims of reducing isolation and contributing to the mental well-being of older men through social contact and meaningful activity. Where target populations have been reached, there is evidence to suggest that Sheds provide important access to social support for those experiencing loneliness and isolation or depression following challenging life events. The coordinator was identified as a vital factor in the success of all three Sheds but with differing levels of input. The coordinator role is thus integral to any consideration of the future management and sustainability of Shed projects. A review of 17 studies in 2004 showed that: Further research into interventions using new technologies to reduce loneliness in older people is recommended. Sum S et al (2008) Internet use and loneliness in older adults.Cyberpsychol Behav.11(2):208-11. Locally age UK may well have access to the available resources or talk to your local social services who are likely to have a handle on what’s out there. 20 KSF HWB5 Level 4 – Demonstrates that they have a supportive role in helping patients to manage and live with illness.